Michael and Erinn's Wedding Video Finally! Thought I would do a catch up post on what has been up. David and Erinn are full on in their studies. Which means I see very little of David. I will be as glad has him when this year is over and-God willing-he will have that little diploma in his hand! And just because my husband CANNOT sit still he thought he would go for a 20 mile run up in the woods on Sunday. Actually when he started talking about it I thought he was kidding since he is still nursing his sore calf. Then Sunday morning he told Caleb to get his bike ready---I was like seriously!! He was. Caleb had a football game after church on Sunday and I was thinking he, at 10 will be too tired to bike 20 miles with his dad on these dirt roads. I who have just started working out a little after mostly a year off with this bum foot. I have been biking a whole 20 minutes about 3 times a week! I biked 20 miles all uphill on the way out on dirt roads. I must admit I was not always thinking pleasant thoughts on this wonderful ride! We both survived--sore legs and all! Caleb is enjoying his football (20)! I really loved the looks his coaches were giving each other the other day. Caleb had just relayed some information to me and I went to them to check if the information was correct. I have wrote some on Caleb's listening issues, so you understand WHY I check up on most things he tells me, but his coaches did not know this, so I told them about Caleb having a hard time listening if there is background noise. That he can not tune it out and listen to what is being said. All three of them looked at each other and grinned!! Yep, it answered a lot of their questions too! And, yes, it was very obvious to them everyday. 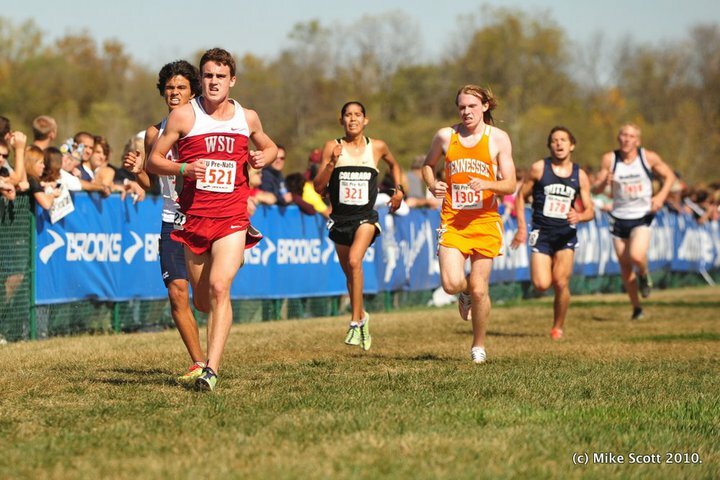 Drew was in Indiana this last weekend running at Pre-Nationals for NCAA cross country. He is learning a lot about running in a big crowd. He ran about mid pack, was 5th man for his team (2 dropped out). He was not overly happy with his race, but it was a great experience. They flew in late Saturday night and he was up very early Sunday morning throwing up. Which he proceeded to do all day. I am very thankful for another mom who was there and picked him up some medicine at the store. He is feeling a little better and looking forward to Pac 10's in Seattle on October 30th. We are planning on heading up if anyone else will be in the area on that weekend. Our 'little bit' is slowly moving along in her school. As you can see her it takes MANY, MANY times of showing the same concept for her to pick it up. She was not able to visually use the ruler on the top of the page. The actual ruler was better, but the concept of measuring from the side of the object and not the side of the paper was not sinking in. Today we will try measuring actual objects. This should make it easier for her. We have finally found a clinic that will be doing a thorough evaluation for us on Hannah. I called the clinic late Tuesday evening and left a message. At 8am the next morning they were calling me back and let me know I needed a referral from our doctor. I called and left a message for the doctor at 9am. They called me back at 11am that they would send in the referral. I got a call from the clinic a 3pm, they had the referral and were sending me paperwork to get started. Now I don't know about you, but this is absolutely unheard of for us. I just figure it must me a 'God thing' and praise Him! So at this clinic she will work with various doctors and therapist, who will then get together and discuss what they have found and come to me with a comprehensive evaluation. The hope is that we can get to the bottom of some of the learning and emotional issues and find out how much is permanent delays, most likely due to her malnutrition and how much is just that she needs extra help or time to navigate through. We are excited for at least some forward motion in this area.